World Diamond Council (WDC) members at the group’s 14th annual general meeting (AGM) in Mumbai, India. 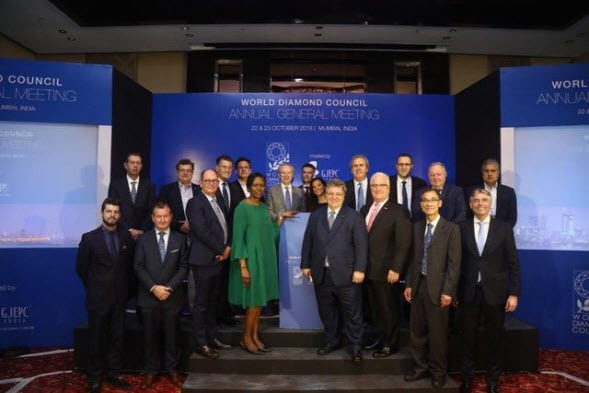 Improvements to industry regulations concerning responsible sourcing were the primary topic of discussion at the World Diamond Council’s (WDC’s) annual general meeting (AGM) in Mumbai, India, earlier this month. These included initiatives relating to WDC’s System of Warranties (SoW) and the Kimberley Process (KP). For the SoW, new and more stringent diamond-sourcing guidelines for members will be incorporated by a strategic planning committee directed by the WDC board. Adherence to human and labour rights, anti-corruption, and anti-money laundering principles will be expected. These guidelines will be implemented on an ongoing basis as part of the council’s 2021-2025 Strategic Plan and will support both Organisation for Economic Co-operation and Development (OECD) regulations and the Kimberly Process Certification Scheme (KPCS). WDC members are also working to expand the KP definition of conflict diamonds to better address human rights and the environment. Two other initiatives (implementation of a permanent secretariat and improvement of the peer review process) will be presented for discussion at the KP Plenary next month. “This year’s session was important for many reasons, not the least of which is our members truly embraced the spirit of collaboration and co-operation that accelerates our ability to drive important change within the industry and through our role as industry observers to the KP,” said Stephane Fischler, president of WDC. The meeting was facilitated by India’s Gem and Jewellery Export Promotion Council (GJEPC) and also featured the appointment of Edward Asscher as WDC vice-president and reappointment of Ronnie Vanderlinden and Udi Sheintal as treasurer and secretary-general, respectively. Additionally, the council is currently working to improve African participation in ethical sourcing initiatives such as the Kimberley Process. Before the AGM, Marie-Chantal Kaninda, executive director of WDC, addressed both the European Union (EU) and the African Union to explore how this can be accomplished, why it is important, and how the KP can benefit African people.